Because of its location in the heart of the Bay Area, then having a total population of about 260,000, and its magnitude, variously estimated as between 6.8 and 7.0, this earthquake was one of the most destructive in California history. Property loss was extensive and 30 people were killed. 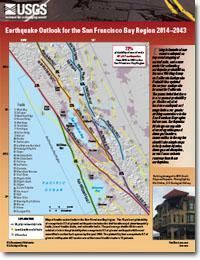 The Hayward Fault—Is It Due for a Repeat of the Powerful 1868 Earthquake? USGS scientists describe the Hayward fault as a tectonic time bomb, due anytime for another magnitude 6.8 to 7.0 earthquake. Because such a quake could cause hundreds of deaths, leave thousands homeless, and devastate the region’s economy, the USGS and other organizations are working together with new urgency to help prepare Bay Area communities for this certain future quake. Using information from recent earthquakes, improved mapping of active faults, and a new model for estimating earthquake probabilities, the 2014 Working Group on California Earthquake Probabilities updated the 30-year earthquake forecast for California. 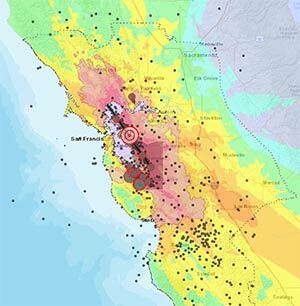 They concluded that there is a 72 percent probability (or likelihood) of at least one earthquake of magnitude 6.7 or greater striking somewhere in the San Francisco Bay region before 2043. A 7.0 earthquake hit the San Francisco Bay Area? 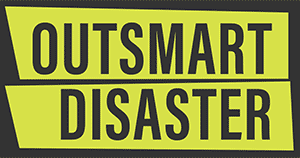 Are you, your family, and your business prepared to outsmart disaster? 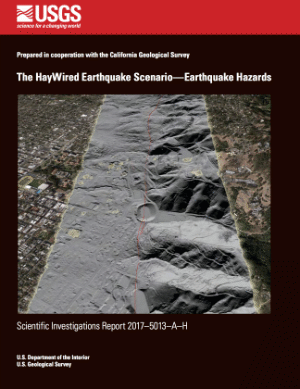 The USGS and its partners developed the HayWired scenario as a tool to enable further actions such as seismic upgrades and retrofits that can change the outcome when the next major earthquake strikes. 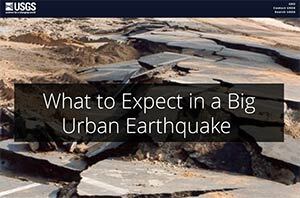 See a summary of this report, “The HayWired Earthquake Scenario—We Can Outsmart Disaster”. This “geonarrative”, which includes interactive maps, videos, and other media, examines the earthquake hazards in the HayWired scenario’s 11-county study area. 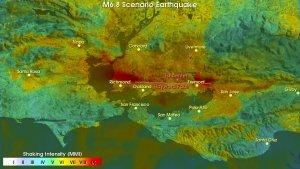 This scenario ShakeMap shows ground shaking caused by a hypothetical M7.0 earthquake on the Hayward Fault. 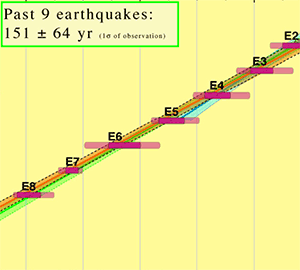 The mainshock (star) is beneath the City of Oakland and causes the Hayward Fault to rupture along about 52 miles of its length (thick black line). White lines depict other major faults in the region. Computer simulations of earthquake shaking on the Hayward and Rodgers Creek faults. This report is a compilation of structural retrofits and replacements of older buildings and infrastructure in the San Francisco Bay Area that have either been completed since 1989 or that are in progress as of October 2018. Learn what you can do before, during, and after a large quake in a populated area. 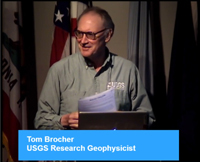 Watch Tom Brocher, USGS Research Geophysicist, deliver the USGS Evening Public Lecture. 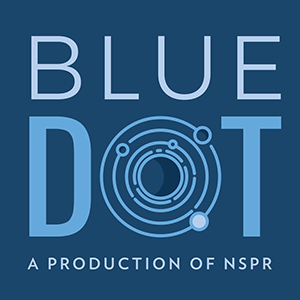 This talk was recorded on September 27, 2018. Host Dave Schlom is joined by USGS Geophysicist Ken Hudnut as they interview two leading experts on the Hayward Fault: USGS scientists David Schwartz and Tom Brocher. 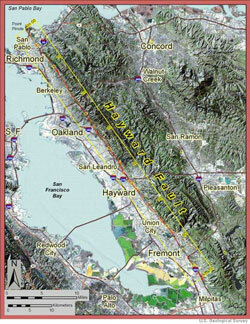 It’s a fascinating and frightening discussion of the “ticking seismic time bomb” beneath the East Bay. The next major earthquake to strike the San Francisco Bay Area will most likely result from rupture of the Hayward or Rodgers Creek faults. 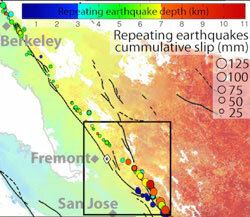 New models show that these faults are directly connected at the surface, which enables simultaneous rupture of the Hayward and Rodgers Creek faults, a scenario that could result in a major earthquake. A new model suggests the Hayward and Calaveras Faults should be treated as a single system with the potential for generating larger earthquakes in the San Francisco Bay Area. How Close to a Fault do You Live? 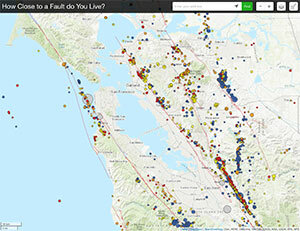 Use our map to find out how close you and your family live to active faults in California. Interactive self-guided tour of San Francisco Bay Area faults and earthquake history featuring ground-shaking maps, historic photographs, quotes from earthquake survivors, and more. You can see the footprints of the Hayward Fault all over the place once you know where and how to look. 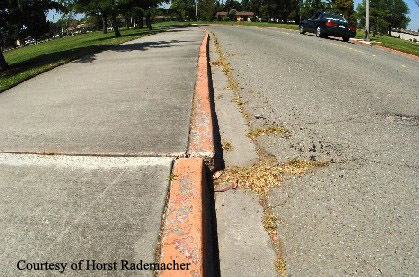 This tour covers The Hayward Fault at the Campus of the University of California, Berkeley. 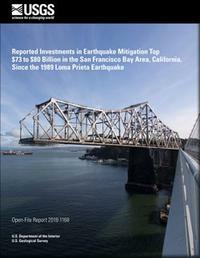 This 1996 report (updated in 2010) by the Earthquake Engineering Research Institute describes what losses are expected to result from magnitude 7 earthquake on the northern end of the Hayward Fault. The Seismological Society of America (SSA) created a special collection of previously published articles focusing on the Hayward earthquake and associated research. 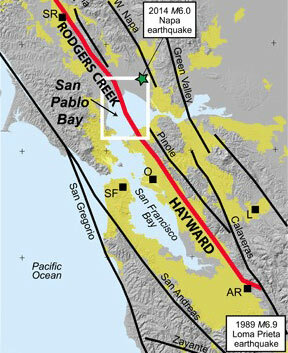 A large, widely damaging earthquake will occur on the Hayward fault in the future, but we don’t know when. Using the tools of paleoseismology, earthquake geologists have determined that large earthquakes occur roughly every 100 to 200 years on the Hayward fault, and it’s been 150 years since the last event. 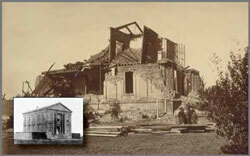 Detailed account of the 1868 earthquake and aftermath by Andrew Lawson, including damage photos.